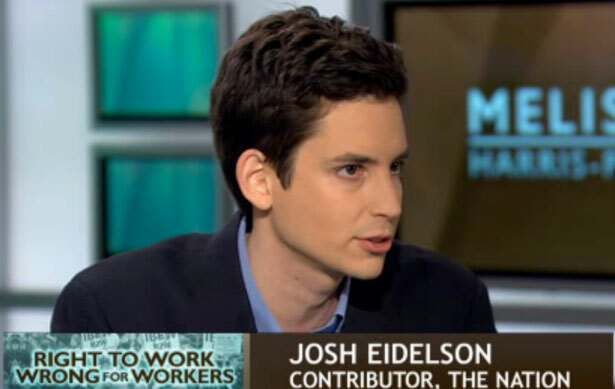 In an interview with The Billfold, Nation labor reporter Josh Eidelson discusses labor organizing, labor journalism and the range of worker struggles happening now. When Boeing workers struck in 2011, The Nation’s Josh Eidelson says, he went to Washington state to bring forward “the part of the story that was about people’s work and people’s resistance. That, whether you agree with the workers or not, really should be part of the conversation. We shouldn’t only be hearing from Newt Gingrich about this.” In an interview with The Billfold’s Logan Sachon, Eidelson discusses his transition from labor organizer to labor journalist, the media’s treatment of labor and the range of worker struggles happening now. Read Dave Zirin’s take on the NFL’s questionable labor relations—which, most recently, involve unfairly interrogating players about their sexuality.